Rich, designer details make this mid-length herringbone jacket a fashion standout. Soutache and embroidery form a regal tone-on-tone motif of flowers, leaves and vines on the back and cuffs. 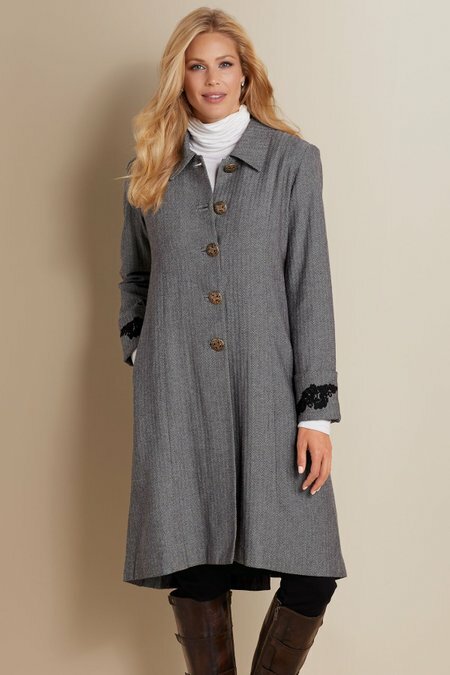 Gracious pleats in back descend slightly below the front hemline creating a subtle high-low effect; princess seams, slim side pockets, and button cuffs complete this gorgeous piece. Cotton herringbone; poly lining. Misses 40"/42" long.